Often when confronted with the pervasiveness of “liking” in the present culture, from the very small (Facebook posts that must receive a “like” as the highest measure of affirmation) to the way-too-big (valuing a presidential candidate’s “likeablity” over any other more significant virtue) I think of Willy Loman’s obsession with his sons being “well liked”–not that they are good people with fulfilling lives but that they are merely “liked” by others. It’s meant to seem to the audience like the delusional misconception of a man who never lived life well, but I worry about our culture becoming like Willy Loman; we all know how Willy Loman ended up. In my experience, a particularly worrisome example (in that it worries me about the future of literature) was in my MFA program: a majority of our time was spent on “I like this”/”I don’t like this” conversations and on the equally useless “I don’t get”/”I don’t understand” conversations. Liking and understanding are two commodities that barely register a blip in any decent greatness measure, yet little time was spent outside this realm, and these workshops are run by people who should know better. I even had one workshop leader who took a vote on how many people liked a story. When the vote was roughly half, he proved only that the workshop was populated by human beings. In the preMFA era, great works were born from tumult and passionate resistance from groups of people with deep knowledge and love of one another, the sort of love that comes paradoxically with a concomitant measure of disdain, but throw a dozen disconnected strangers together and no wonder critique has the superficial pointlessness of a Facebook feed. Don’t get me wrong: liking is valuable, granted, but it is a value so lacking in power and durability it requires hit after hit. It’s why the Facebook feed goes by so fast. It’s why likable novels get consumed in much larger numbers (I think of the way my wife burns through endless romance novels but she’d never profess any passionate love for them). It’s why likable songs get played on repeat. They have to be to get the same high. When the temporary buzz wears off, you hit until there’s nothing but used up husk remaining. A more substantial and durable love is based on risking being disliked, unsettling, or displeasing. It provides the sort of high that only needs one hit to work but still we crave a constant return. Conventional wisdom you might hear from educators is that liking lacks significance because it’s only doxa level truth, truth only valid to the individual. A wiser student seeks a truth valid to all. This is great for science and politics and rhetoric, but art (fiction included) is all doxa. It needn’t conform to any truth outside the individual. The real issue is liking is a weak stimulator and the easiest stimulator to elicit and measure and so the province of the lazy. Hence why I call it a comforting stimulator. Snuggling in a teddybear mountain might make you feel happy but the sort of happiness that preludes a nap. I’m the last one to argue for the total elimination of likability as a consideration. It’s a nice component and perhaps a starting point of any valuable experience. You have to like someone on a first date to even contemplate marriage, but any married person knows liking is such a small component to the more complicated, sometimes hate-filled, but ultimately more rewarding experience of marriage. Likewise, if you dislike a book from the beginning, why continue reading it? But I doubt Thomas Hardy in the composition of Jude the Obscure ever said, “I better tone this down, or I’ll bum out all my readers.” He was more interested in piercing hearts and haunting readers, leaving readers with a sort of masochistic guilt of loving the emotional abuse of death and heartbreak and despair. I doubt Allen Ginsberg ever read the early drafts of Naked Lunch and said, “Sorry to break this to you, Bill, but I doubt it’ll get a thumbs up across the demographic spectrum.” Burroughs was more interested in plumbing the terrible depths of souls and exploring new possibilities of what literature could be. Likability is the last thing on his mind. I first came to the realization of how little my reading comfort mattered after reading The Fixer by Bernard Malamud. The things that happen in the book to Yakov Bok, a falsely jailed victim of antisemitism in Tzarist Russia, are so unforgivable and horrifying that I yearned for some redemption or exoneration, soldiers swooping into save Yakov and blow away the Tzarist pricks, but the level of torture Yakov endures would require some Inglourious Basterds level revenge. When no such redemption occurred, I was left hating the book. Then I had the revelation: I love the book because it wouldn’t let me go. Don’t take my choice of examples the wrong way: this is no Great Works Initiative argument. I’m talking about a personal experience that could happen with any type of book. Too often literature is split into oversimplified dualities — the false notion literature requires deeper devotion than superficially pleasing genre fiction, for example — that fail to capture the true complexity of the reading experience. Genre fans know well (better even) the love/hate intensity of fandom. Nerds, by definition, are more likely to describe what they love in terms of loving than liking. For example, Harry Potter fans would never claim to like the emotional torture of the mass good-guy-slaughtering that ramps up as the books progress, but it’s hard to imagine loving the books without this essential ingredient. 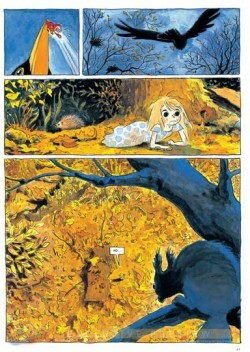 This became an issue in a recent book group conversation about the French graphic novel Beautiful Darkness. It’s a massively unsettling book about a dead girl rotting in the woods and the tiny creatures who once populated her body (or mind) now liberated and forced to survive in the woods. Most are unprepared, too dumb or innocent, or too prone to succumb to the worst of human nature, and most fail horrifically in this test of survival. Other members of the reading group disliked the book for its unsettling qualities, for its lack of answers or redemption or resolution. The group groped for metaphors to explain the tiny creatures, embodied personality traits and so on, but I would consider easy conformity to such metaphors a flaw. I loved the book precisely for its unsettling qualities and its resistance to easy answers. But this is not the sole province of indie comics; I didn’t really like the other indie comics we read (Essex County, Blankets, Daytripper) for their easy metaphors, for overly comforting endpoints (epiphany, catharsis, resolution, etc.) and characters who failed to elicit much emotion either way. The rest of the group felt the opposite on every point (hence the irrelevance of liking and complete subjectivity of value). For example, Daytripper had a gimmick that could potentially illicit discomfort (and thus passion) but the discomfort is undermined by inorganic arbitrariness and easy conformity to metaphor, leaving little to attach to but a character who may be unlikable but hardly interesting enough to illicit any emotion at all. In other words, it didn’t work for me the way it worked for plenty of others. Likewise, the comic I nominated for the group as the greatest permutation of the form was The Infinity Gauntlet, a story so quintessentially Marvel Comicsy, all their movies are headed towards it. Marvel Comics is at its height of popularity and thus, set in too many simplistic competitions with so-called deep/serious work, is often accused of the sort of weak likability of superficial crowd pleasing. While I could argue this is rarely ever true of Marvel Comics (a long and complicated argument I’d love to have with you one day) this is certainly not true with The Infinity Gauntlet. The hero of the story is a genocidal maniac. Every conventionally heroic moment (from the conventionally heroic supposed heroes opposing the true hero) ends in death and helplessness. The bad guy/hero is so complete in his victory that when the reversal comes (because of course a reversal will come) and the conventional good guys win, it seems like the only thing that can defeat the villain is deep rooted insecurity and the inevitability of hero victory within the form, turning the villain into a tragic hero and justice into injustice. There’s little simple or superficially pleasing about it. In a great story like this, liking and disliking are flavors working with or against each other to enhance the overall greatness of the piece while more substantial commodities that risk displeasing through intensity have a greater capacity to forever haunt a reader’s life.